Have I mentioned that I love Italian food? Well, if you’re the same way, you will love this dish. I spent a summer studying abroad in Italy a few years ago, and it was an amazing experience. I learned about history, art, culture, language, architecture, and SO much more. The 6 hours of college credit I received does not fully express the amount of knowledge I gained there. However, doing all that learning (and walking…lots and lots of walking) in Italy really works up an appetite! And believe me, I was more than happy to educate myself on some legit Italian food. I ate gelato, pastries, pizza, and pasta at every available opportunity (and there were many). Fun Fact: Did you know that in Italy, restaurants do not have “to-go” boxes? If you ask for one, they will look at you with a stare that clearly says “why would you ever eat something that’s not fresh?” because, in Italy, EVERYTHING is fresh. There’s not even a frozen section in most of the grocery stores. So you’re faced with the torturous decision to either waste all that amazing food left on your plate, or just eat it all and feel like a gluttonous stuffed pig. Anyways, ya know how they say that scent is the sense most closely tied to memory? Well that’s how I feel whenever I smell pesto. No matter if it’s freshly made or from a jar, when I smell pesto, I’m transported back to the little cafe next to our apartment in Florence. So, needless to say, I loved this recipe. I hope you do too! Maybe these scents will bring back memories for you too? Or perhaps create new ones for you to remember in the future! Trim any excess fat from the chicken breasts. Cut each chicken breast in half lengthwise so you have two flatter pieces of chicken. Preheat your grill. Salt and pepper the chicken breasts. Once the grill is hot, grill the chicken for about 10 minutes (or until done). Turn your oven onto the Broil setting. Line a cookie sheet with foil and spray with nonstick spray. When the breast pieces are finished grilling, place them on the prepped cookie sheet. 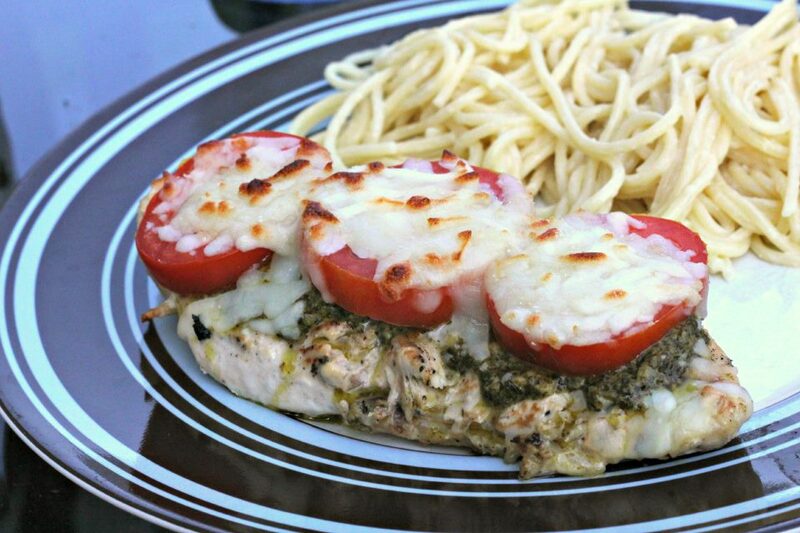 Spread 1 Tbsp of pesto over each breast. Lay 2 or 3 slices of tomato on top of the pesto. Then top with mozzarella. The chicken breasts are now ready to go under the broiler! Watch them closely while they broil and remove from the oven when the cheese has fully melted and there are a couple browned edges (approximately 5 minutes).